Fox is a name that people know and respect when it comes to suspension technology. They have become a benchmark in the mountain biking industry and continue to lead the way with new innovations. The 2019 Fox 34 Float Factory 27.5" features the best of the best technology that Fox has to offer. 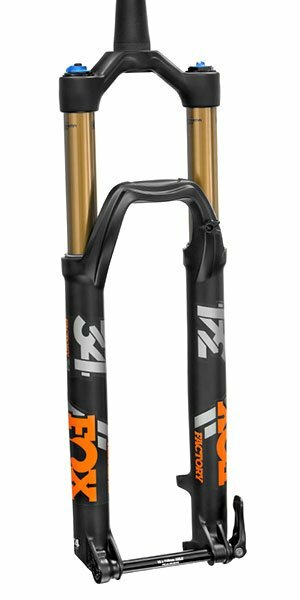 It has Fox's Kashima coating on the stanchions that gives them a buttery smooth feel and makes them incredibly durable. The Fox 34 Float has a FIT4 damper that provides three compression damping adjustments that can be made on the fly so you can adapt your fork to the various trail conditions. This fork is perfect for trail and all-mountain riding and will quickly become the most loved part of your bike. I got this to go on the Ibis Mojo 3 I also bought here at Jenson. I have the 140mm travel version, and love it. Set up has been pretty easy so far, but I haven't have to remove or add any volume spacers. I also ride more to the XC side of Trail riding, so I haven't really pushed the fork too hard. But what I have used so far has been really plush and buttery smooth. Compared to the 2018 RS Pike RCT with 150mm travel I previously had, I think the Fox is significantly better. This might be the smoothest fork I've ever owned. Hi do you have 51mm rake version?